Tom Hiddleston has filmed an advert for Centrum for the Chinese market and it’s leaving people on this side of the world a little confused. The confusion does not revolve, as you might expect, around language differences – the ad is mostly in English – but around what exactly he’s supposed to be doing and why he looks so forelorn. The ad is filmed from the POV of a woman who gets out of bed and walks downstairs to find him in the kitchen preparing her an appetising breakfast of raw vegetables with a fried egg on top. “I finished up so I thought I’d pop back and make you breakfast,” he explains. He serves it up alongside some Centrum vitamins and says, “You look great” before getting up, putting on his jacket, and saying he’s going to be a “bit busy for the next few weeks” but promises to make it up to her. Or you, since he spends almost the entire ad making lingering – very lingering – eye contact with the camera. Hiddleston will soon be seen reprising the role of Loki in Avengers: Endgame and has garnered rave reviews for his performances in everything from Coriolanus to The Night Manager to I Saw the Light. It’s fair to say the ad is possibly not his finest hour. 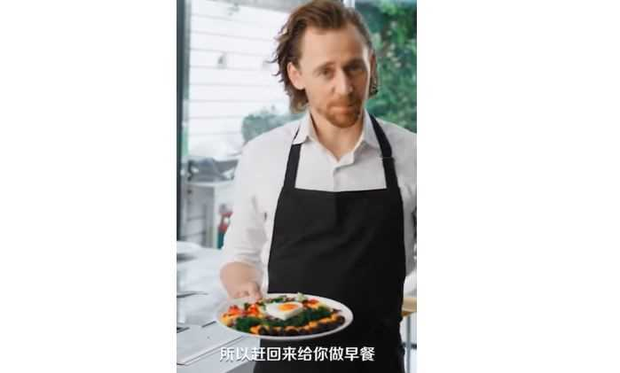 Did Tom Hiddleston really just make me a plate of raw vegetables for breakfast?